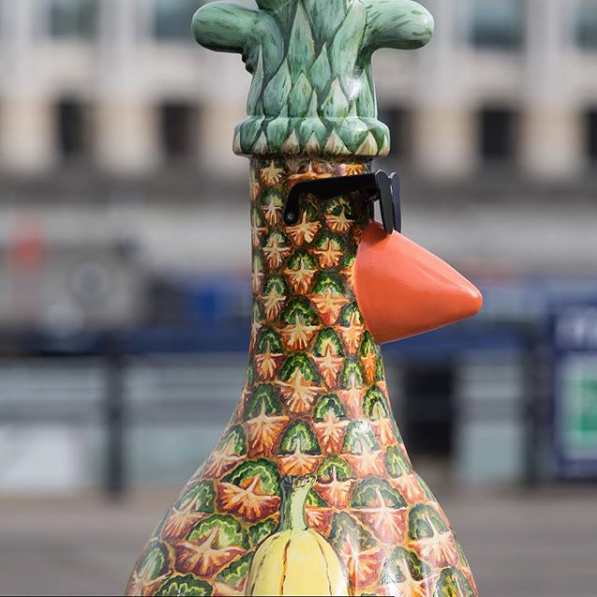 Back in 2015 I had the chance to pick up my scenic painting brushes again to be part of the Shaun in the City sculpture trail which saw hundreds of thousands of pounds raised for The Bristol Children’s Hospital by The Grand Appeal a charity set up by Bristol’s own Aardman Animations. 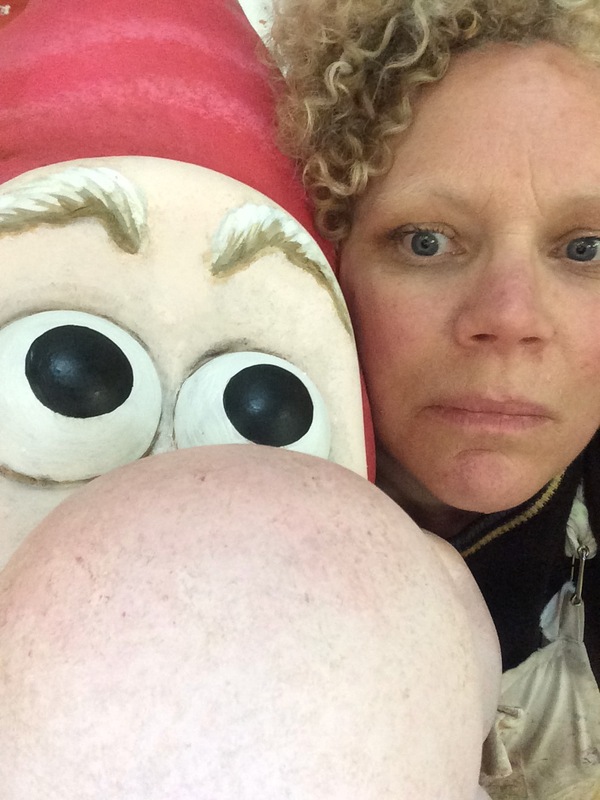 A whole summer of fun for Shaun spotters around Bristol! I designed and painted a oversized Shaun the sheep playfully called Shaun on the cob -a sheep made up of more than your five a day vegatables! As well a feeling good about being part of such a worthy cause ,it was such fun to paint and it introduced me to many new local artists and local businesses. 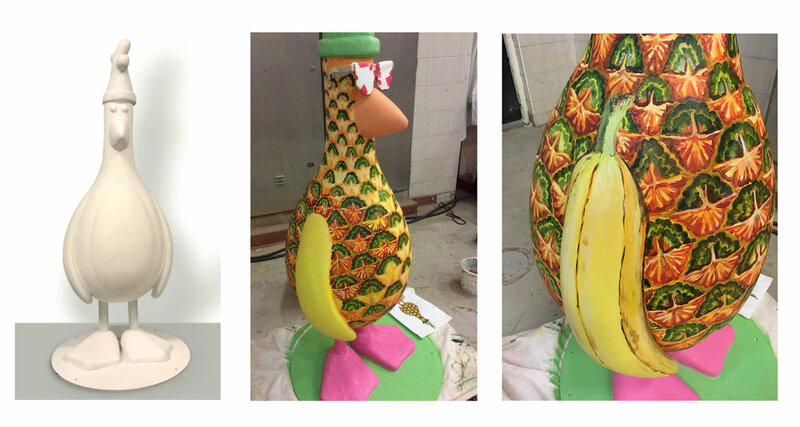 So this year when I heard they were running another sculpture trailI I was so pleased to be asked to paint not one but two of the sculptures This time: a Wallace to look like a garden Gnome sat on a bench and a pesky penguin (Feathers Mcgraw) to look mainly like a pineapple with banana arms! Painting took place in the top secret location of the Bottle Yard studios on the outskirts of Bristol, the largest dedicated film and TV studio facility in the West of England. It was such fun to be out on location for me, as I usually work from my home studio. It wasn’t really very glamorous but I really enjoyed the cycle commute and the company and seeing fleeting glimpses of exciting stage sets and props and even the occasional celebrity! He was sponsored by Credit Call and spent this summer in south Bristol on North St.
By the time I got to paint my Wallace characteur I felt properly warmed up, as was the weather! I can’t take credit for the original idea but I was given full range to add appropriate motifs to his outfit and cuppa. I think I enjoyed painting this one more because of all these factors! The devils in the detail! Gnomey did go through a very dirty phase when I decided, as he was a garden gnome, he should be properly muddy! However, in the end it was decided he needed to be a bit posher and he got cleaned up again. I think this was the right decision considering his fantastic position for the trail , on College Green in front of a beautiful blooming bed of flowers and the Cathedral. Below is a picture of me and Gnome sweet Gnome taken by Natalie Lam for Naturacare’s blog post on me and Gnome sweet Gnome. Natracare sponsored him. I’m writing this post on the last day of the trail- but you can still go see all the sculptures under one roof up at The Mall, Cribbs Causeway for The Greatest Dog Show ever, running from 15th-30th September 2018 . After that they will be auctioned off sometime in October and hopefully raise a huge amount of money again for The Bristol Childrens Hospital!